How to have an impact and how to make the world a better place through innovative learning? 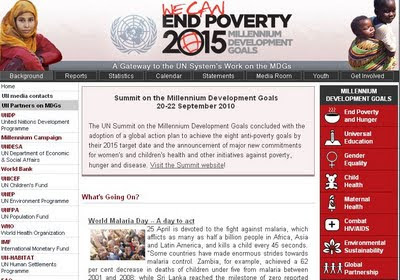 "Let's come up with ideas to relief some of the harsh situations people around the world are facing! ", this simple motivational sentence was launched at the MobiMOOC course. The MobiMOOC course is in its fourth week and discussions and exchanges of ideas keep on going. This week’s facilitator of the course is David Metcalf from MetilLab in California, US. He offered a view on some of the latest mobile innovative edge projects ranging from sports to learn statistics, over free mobile medical applications, to aid relief and augmented reality. 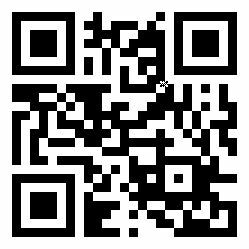 If you are interested, his webinar was recorded and if you are interested you can follow the four part YouTube movies here or via the depicted QR code below. There was one specific thought that David raised which has given me gray hairs for the past few days, so I want to share it in the hope some of you can come up with some ideas. The only problem is, what can we do? How can we make this beautiful globe a better place while using mobile technology? There have been many initiatives, and some really make a difference (empowering women, mobile literacy classes…) but what is within our power AND who is willing to go for a grand impact collaboration? Next Wednesday (4 May 2011) you can follow a free webinar featuring a presentation and discussion with Dr. Rita Kop and Dr. Helene Fournier of the National Research Council, Canada. After speculation in the literature about the nature of possible Personal Learning Environments, research in the design and development of a PLE is now in progress. The researchers speaking in this session will report on the educational research involved in the National Research Council of Canada, Institute for Information Technology’s Personal Learning Environment project. This presentation will highlight important components, applications and tools in a PLE as identified through surveys of potential end users. The learner experience and the minimum set of components required to facilitate quality learning will be placed at the forefront. *Local times for the CIDER sessions for those living in other areas around the world, look here for different timezones. Please make sure your Mac or PC is equipped with a microphone and speakers, so that you can use the audio functionality built into the web conferencing software. Please note that it is extremely important that you get your system set up prior to the start of the event. Information on installing the necessary software and configuring your PC is available at http://www.elluminate.com/support/ in the “First Time Users” section. As I was diagnosed with diabetes type 1 a month ago, I have been reading up on some mobile solutions that are in the pipeline. So from time to time I will put in a diabetic post as it is related to health and mobile solutions. Carlos Kiyan is one of my closest colleagues and friends. Carlos pointed me in the direction of the painless GlucoReader that monitors blood glucose levels via micro-needles (which have been tested for the flue before). Painless glucose monitoring immediately got my attention, as the glucose finger stick pricking is PAINFUL and a bit difficult to do depending on the situation (one should not do it while driving a car!). Four engineering students got their heads together and came up with a start-up company that would allow diabetics to monitor their glucose via a micro-needle patch which sends the blood glucose level to an android and/or iphone smartphone. 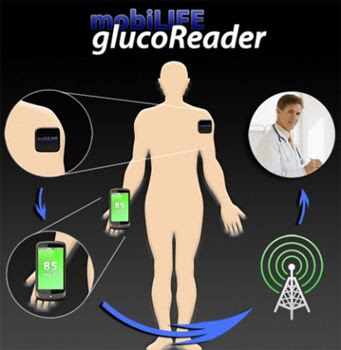 The transmission is done via bluetooth, which is used for other diabetic innovations as well. The start-up is located in Boston, US. 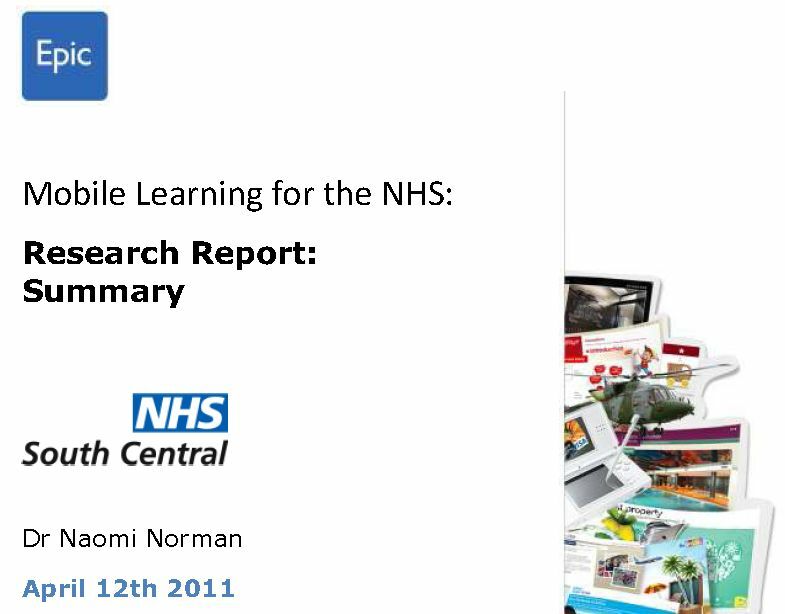 Full research reports sometimes stop me from really reading it in full, so I was very happy when the Epic newsletter dropped this summary research report on mLearning for NHS (UK's National Health Service, but also accessible for other countries health services) in my mailbox. The report is relevant for everyone working in the health field or interested in setting up mobile learning for their companies as many of the recommendations can easily be translated to a different corporate field. The report starts of with a nice overview on the benefits of mLearning (just-in-time, any place, context...) and moves on to show which type of mobiles are already in use at a specific NHS region (both looking at practitioners and managers). After having analyzed the possibilities of mLearning (both as a stand-alone, or for blended training use) the report delivers a great set of 29 recommendations to increase mLearning at NHS level, while taking into account the context and the contemporary mobile devices. ensure the NHS is able to exploit mobile learning to benefit staff professional development, both in current times and into the future. A communications campaign is put in place to raise awareness among NHS staff and key stakeholders of the multitude of benefits to mobile learning. 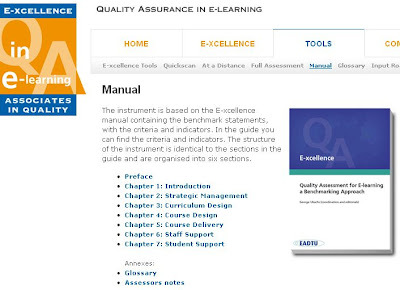 Quality Assurance (QA) hits all of us at some point, but QA in eLearning is fairly new. I was looking for something else when coming across this nice quality assurance online manual that is the result of a European Research on quality assurance. Although I do have some constraints while reading through the benchmarks (the term quality assurance does that to me), some of the pointers are indeed helpful. This online manual features six chapters each focusing on a specific eLearning part and in total it features 33 eLearning benchmarks. In the guide you can find criteria and indicators which are useful if you want to screen your own institutional eLearning. The structure of the instrument is identical to the sections in the guide and are organized into six sections. The authors recommend that we first do a quickscan of the manual. Based on the results of the quickscan, you can restrict your focus in the manual to certain chapters. 7. E-learning components should conform to qualification frameworks, codes of practice, subject benchmarks and other institutional or national quality requirements. The manual is useful, I particularly liked the fact that they make a distinction between indicators and expert indicators. E.g. "At excellence level: There is extensive institutional experience of delivery using blended learning and this experience is widely shared through the organisation. Well informed decisions on the use of pedagogic components are made routinely and reflect institutional policies regarding the development of learner knowledge and skills." As the MobiMOOC is well in its second week, the presentations are becoming increasingly inspiring. If you are interested in mobile project planning, Judy Brown's presentation will get you on the way in just a couple of relevant steps. 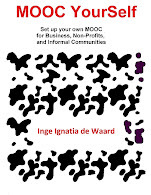 The MobiMOOC course is well on its way and the interactions are relevant and they get the participants into the sharing mindset which is related to the connectivist idea of building knowledge by exchanging ideas with peers. Connections? Emergence? Chaos? Complexity? Fractals? Quantum Theory? Although many of these terms originated and have been widely studied in the natural sciences, they are emerging as important interdisciplinary ways to understand both natural and social sciences, including education. The question therefore arises ... are the traditions of what it means to teach and learn being challenged by these concepts, or are we simply experiencing the natural evolution of education through a process of emergence? • Emergence encourages random encounters, paying attention to your neighbours, and “more being different”. Through such encounters and interactions we can look for patterns in the signs which can be extrapolated to an entire system, the intelligence of which comes from the bottom up, and where low-level rules can create high levels of sophistication. • The connections being made between people through social networks has emphasised “connectivism”, an emergent theory of learning where the interactions that are generated by these connections, whether informal or formal, have the potential to result in new, emergent knowledge. 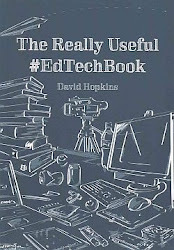 • For designers, taking account of emergence and connections can challenge the traditional models which have been used to create ‘instructional order’. Emergence theory offers insights into complex adaptive systems that can self-organize, a quite different way of conceptualising the teaching/learning space. Given this link between connections and emergence, and the significant impact this association would have on how we teach and learn, it is therefore important to analyse what it means to design for emergent, connected learning experiences. The purpose of this special issue of IRRODL is to provide a forum to explore connections, emergence, and design for learning, and in so doing be sensitive to emergent ideas. Because we’ve designed and implemented education in one way for decades does not mean it’s the right way! We encourage your ideas for topics, with the following list (by no means exclusive) identifying possible topics to be covered in this special issue. 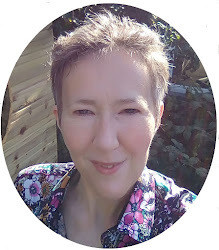 • Connections and emergence – is ‘design’ realistic? Submissions, especially those that apply multidisciplinary approaches to online and distance teaching and learning, are welcomed for this issue. Authors submit their manuscripts online by registering with IRRODL then logging in and following an automated, five-step submission process.